Finally got around to messing with this setup again..
How do these temps look? 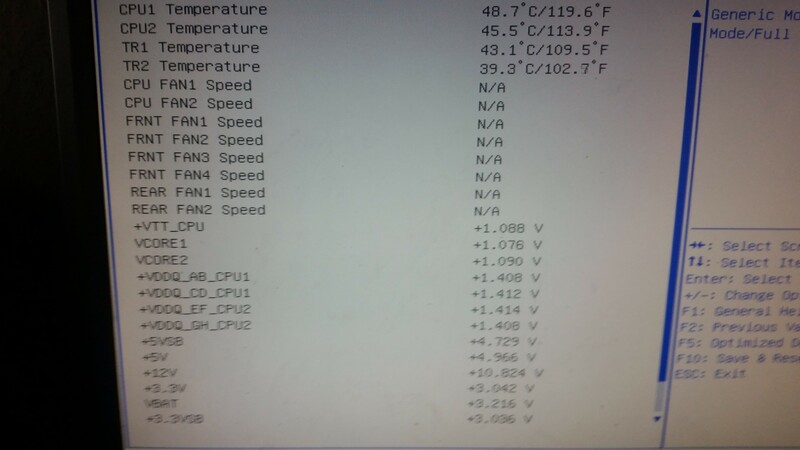 It used to be that cpus didnt HLT or NOP in bios, so that temps reflected somewhat full load ... Is that still the case? Bonus question, those voltages, should that worry me? Edit : direction of fans right now is sucking air out of the monstrous heatsinks I got on there... Turn em around (old case fans so they were designed this way.)? There is higher power usage, but no, temps in the BIOS are not reflective of full system load. Either way though, your temps look just fine. Most servers on that platform have temp warnings in the 85-90C area so as long as you're operating in a proper environment, the CPUs are designed and validated to be high temperature pretty much all the time. We still have Cisco B200 M3 blades that have been running non-stop 70% or higher CPU usage for 5-6 years now with CPU temps on the back CPU usually in the 75-80C range. Those CPU's are validated to be hot during most of their life cycle.